In this weeklong intensive class, we will explore these three handbuilding techniques as they concern the building of pots (main emphasis is on function). Those who want to build non-functional pots, but want to hone these skills are also welcome to partake as these systems come in just as handy in one’s own lovely world of make believe and imagination. We’ll work with textures using all manner of objects: Indian fabric stamps, seed pods, junk from the dollar store, whatever. Then we’ll add color with stained slip used in a pudding consistency known as ‘dry brushing’ so as not to obliterate the texture. Detailed instructions for glazing and firing (including my recipes for clay, slip, and glaze) will be provided. With only one week to work, participants will go home with either green or bisqued (but not glazed) pots. 3-4 pieces of cotton sheeting. Take an old worn out flat sheet and cut or rip to get some 20” by 30” pieces. If you don’t have one, no worries as I’m sure we’ll have extra. Banding wheel to work on. * Pottery supplies sell inexpensive, decent ones for about $10 bucks. Any and everything you can muster to make textures with. For the first 30 years of my career, ‘being of use’ in a literal way was paramount: tea sets, soup tureens, cake plates, deviled egg servers, you name it. And now, sauntering up to age 50, I don’t so much need to be of use, I only need to be. Freedom! Things I’ve been making recently cover a wider gamut unable and unwilling to be categorized. My goal is to stay open as I journey through this transition. Simple. Not easy. But oh, how I love to be in the studio with this partial blindness. I rely on other senses. I’ve begun using found objects with the figurative works and these objects serve to trigger subconscious ramblings and rumblings which, when brought out into the light of day, cast long shadows that take me through unknown doorways and out into a new openness where the air feels different on my skin. I have, in fact slid down the rabbit hole. Lisa Naples is an internationally-recognized, award-winning potter who lives and creates in Doylestown, Pennsylvania. 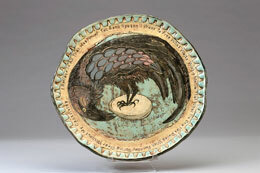 She has studied, taught, and individually explored the art of pottery for thirty years. During the last twenty of those years, red earthenware has been her clay of choice because of its forgiving nature and rich, earthly beauty. Lisa spent the 2005 summer Down Under at the Australian National University having been awarded the premier studio residency in its category by The National Council for the Education of Ceramic Artists. Her vast knowledge and worldwide appreciation of pottery has led numerous schools, universities and art centers around the country to invite her to lecture and teach their students.